These dolphins are evidence of a complicated history. They have some of the characteristics of dolphins that made the jump to fresh water, and they show that that jump might not have happened in a single leap. The fossilized skull, shoulder, and flipper bones that formed the basis for this sketch were found in Panama, near the coast, surrounded by other evidence of marine animals. 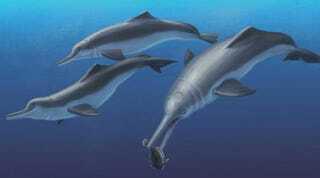 Fossilized dolphin bones found near the ocean shouldn’t be a surprise to anyone, except that these remains have characteristics of river dolphins. Isthminia panamensis represents a physiological cross between the four species of contemporary river dolphin and the more common marine dolphins. The results of our phylogenetic analysis, however, cast some complexity on a simple scenario of marine-to-freshwater directionality . . . . Taken at face value, our analysis points to either two separate freshwater invasions in South America from marine ancestry at different times . . . or a single invasion with the origin at the unnamed clade . . . with a marine re-invasion leading to Isthminia. Dolphins might have made the change from salt to fresh water more often than we imagine. They might have even made the change from salt water to fresh water and then back again. Note: This post was wrong and has been completely re-written. Readers, you have my apologies, as do the researchers who worked on this project. Top Image: Julia Molnar / Smithsonian Institution. Second Image: Nicholas D. Pyenson / NMNH Imaging / Smithsonian Institution.